Lately, it seems like everyone on the internet is a graphic designer, with customized infographics hitting every news outlet, blog, and personal website. Some have even dubbed 2012 “The Year of the Infographic.” Now, thanks to an ever-growing group of online services, librarians without graphic design backgrounds can start creating their own infographics in just a matter of minutes. Loosely, infographics use pictures, words, graphs, and other visual elements to express information. Ideally, infographics are designed to uses these visual elements to organize complex ideas and data into a more easily understood form. For a more detailed explanation, see “InfoGraphic Designs: Overview, Examples and Best Practices.” Or, check out the “What is an Infographic?” infographic. Infographics themselves, along with other data visualizations, are certainly not new. And here at LibraryTechTalk we have already discussed a few different tools for creating visualizations. But recently there are new online services that offer ready-made templates and themes users modify by adding their own data. This means slick, professional infographics can now be created by just about anyone in less time than it takes to learn more advanced graphic design software. While there has been some criticism of these types of tools and the products they create, they are potentially valuable options for the everyday user who is intimidated by more advanced applications. Piktochart – Jumpstart your own infographics using one of their ready-made themes. Piktochart offers a free basic service, as well as two options to upgrade to a paid “Pro” account – Monthly or Yearly. WIth the Free account, you can choose from 5 free infographic themes which allow for some limited color and font customization, as well as pre-loaded shapes and graphics. 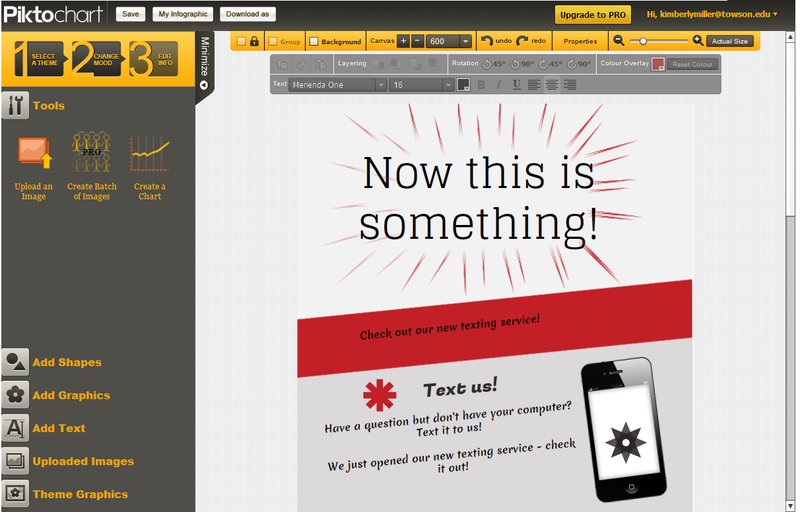 After you “load” a theme, you can add or change graphics, shapes, and text on the page. There is also a chart wizard where you can manually add data to make a simple chart, or you can import your own data in CSV files. You can also upload up to 5 of your own images. When you’re finished, completed iinfographics can be saved and downloaded as an image (.PNG), but with the free account all of your images will also include the Piktochart watermark. Creating an infographic with Piktochart. Upgrading to a Pro account gives you access to over 70 additional themes, more options for customization, up to 100 slots for uploading images, downloading as raw data, and watermark-free images. Easel.ly – Use visual themes (which they call, “vhemes”) to create and share your own infographics. Signing up for a free account gives you access to 15 vhemes. In the “creation tool,” drag and drop the vheme of choice onto the canvas, or choose to start with a blank canvas. Next, customize the infographic using Easel.ly’s pre-loaded objects, adding shapes or text, and uploading your own images. Unfortunately Easel.ly does not include any chart-making capabilities. Due to this lack of feature, Easel.ly does not necessarily stay true to the “infographic” ideals, but is an easily-accessible tool for an average user to begin exploring infographic creation. Easel.ly is currently still in beta, which means there are likely additional tweaks and improvements ahead. Librarians are thinking critically about how to translate data about our services into easily-digestible and meaningful messages. Iowa State University Library is using data visualizations (including infographics) to tell their library’s story. The American Library Association has also used an infographic to demonstrate nationwide cuts to library budgets. Infographics could be an additional tool in our instruction toolbox. Think about what kinds of skills might benefit from a more visual explanation. Students could create their own infographics to demonstrate what they learn in a library session. For example, Bizologie has created an infographic outlining how to research private companies. 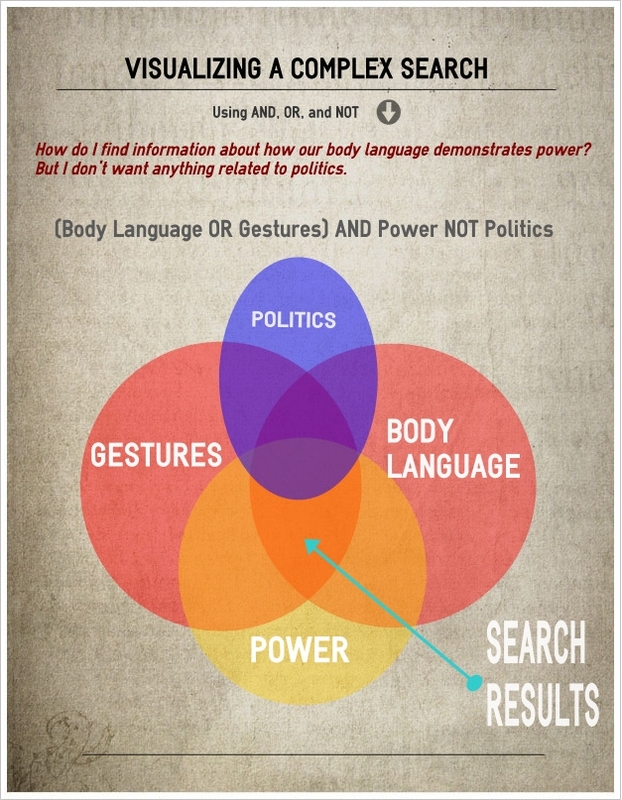 Even if we choose not to create our own infographics, we are concerned with visual literacy. As per the ACRL’s Visual Literacy Competency Standards, “visual literacy” as “a set of abilities that enables an individual to effectively find, interpret, evaluate, use, and create images and visual media.” As infographics continue to increase in popularity, librarians will play a role in helping users effectively interact with visual information. Do you have a favorite infographic or tool for creating infographics? How is your library using infographics? Tired of seeing infographics everywhere? Great first post! I ran across the Periodic Table of Visualization Methods a few weeks ago: http://www.visual-literacy.org/periodic_table/periodic_table.html. Still working on how to apply visualizations to instruction, but at least there are a lot to choose from!